Towa Tei is one of the most recognized and respected DJ’s to come out of Japan. Fans of old school house and dance music may recognize the group Deee-Lite, which he was a part of in the early 1990’s. The group sky rocketed to fame with their funky dance single, Groove is in the heart, which was a huge billboard success in the United States. Since his rather less than likely humble beginnings, Towa Tei has gone onto to forge a solid career in electronic music, garnering him international praise, as well as being credited as both a pioneer and innovator of this music genre in his homeland of Japan. He has collaborated with internationally recognized artists such as Kylie Minogue and Ryuichi Sakamoto. In 2007, he contributed the track Ex-boy, to Shinji Aramaki and John Woo’s anime motion picture, Appleseed Ex Machina, based off the famous manga by Masamune Shirow. Ex-boy proved to be one of the strongest tracks off the Ex Machina soundtrack, which is a bold statement in itself, considering the variety and caliber of talent that contributed to the score for the film. 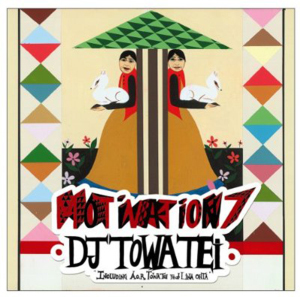 Towa Tei’s most recent release is Motivation 7, which is yet another compilation album put together by him. It features innovative remixes as well as original tracks by some of the industry’s best electronic artists. Towa Tei is one of the most talented Japanese electronic artists active today. The man has been carving out delicious cuts of electronic goodness for over 10 years now. It was his start in the music industry in the early 1990’s with New York pop/dance trio Deee-Lite, that really laid the foundation for the rest of his career. His early experiences with mainstream pop music greatly influenced his sound, since a lot of his music following his work with Deee-Lite have a very evident pop feel to them. What is great about Towa Tei, is that he knows how to fuse experimental electronic soundscapes with catchy pop vocals, which makes his music very accessible to the average listener. His song Risk Some Soul off his fourth solo album Flash, is a perfect example of how he has mastered the art of fusing pop and electronic music. Towa Tei is also well known for his purely experimental sound, and tracks like Ex-boy off the Ex Machina soundtrack, highlight his ability to mix and mash up unique and at times mind numbing electronic sound effects, into a cohesive and catchy electronic record. Fans of electronic music who have not heard of Towa Tei, need to start to familiarize themselves with his music. He is without a doubt, one of the most innovative and highly skilled artists in this genre from Japan, equal and if not better than some of his peers like Cornelius and m-flo. Towa Tei dropped his latest release in Japan on September 29/08, Motivation 7. The album is the seventh release in his Motivation compilation series, and it features remixes as well as original songs from a variety of artists. Check out the music video below to the opening track off Motivation 7, A.O.R. The song is produced by Towa Tei and features vocals by Lina Ohta.